Love That Max : Those first baby smiles: for your viewing pleasure! 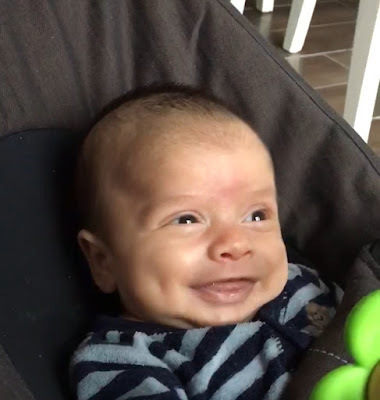 Those first baby smiles: for your viewing pleasure! Ben has been going through a growth spurt and wants to eat constantly, which has made it a little challenging for me to do things like showering, eating, drinking and generally having a life away from our couch. So his first smiles have arrived just when I need some mom fuel that even coffee can't provide. Aww Ben! You are so adorable! And that is quite the grin! Nothing subtle about that, and dimples, too! So sweet to see Ben's beautiful smile join the glorious smiles of your other two. There's something about all three of their smiles that make me grin in response. Hey, I'm really sorry about this, but when I was younger and stupid, I posted a comment on one of your videos saying not so pleasant stuff about Max. I'm not asking for forgiveness, I just want to say I'm really sorry about this.